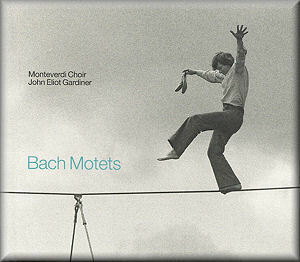 This is the second recording of the Bach motets by Sir John Eliot Gardiner and the Monteverdi Choir. Their first, a two-disc set for Erato, was recorded as long ago as 1980 and released in 1982. I believe it’s still available (Warner: 2292459792). The set included the six motets included here – but not Ich lasse dich nicht, du segnest mich denn – and also some additional material in the form of another motet, BWV 231, and three cantatas, BWV 4, BWV 118 (regarded by some, including the late Alfred Dürr, as a motet) and the single-movement BWV 50. Apart from the fact that the earlier set was made under studio conditions, rather than taken from live concerts as is this new release, there are one or two other important differences between the two sets. Chief among them is that in the first recording Gardiner utilised colla parte instrumental doubling of the vocal parts in both BWV 225 and BWV 226 whereas all the music on the new set features only a continuo comprising cello, double bass, bassoon and organ. While I’m not proposing to discard my copy of the earlier set I should say up front that in my view it is superseded by the new set. Incidentally, three of the motets were included in various volumes of Gardiner’s Bach Cantata Pilgrimage – BWV 225 in Vol. 16, BWV 226 in Vol. 9 and BWV 227 in Vol. 19 – but those are not the same performances that we hear on this present disc. BWV 230 is given a super performance, the singing lithe and joyful. There’s a fine spring to the rhythms. Where Bach broadens the pace at ‘Denn seine Gnade und Wahrheit’ the added sonorousness in the singing is apt. The concluding ‘Alleluia’ dances irresistibly. In his scholarly and fascinating notes Sir John comments that some have questioned if this piece is truly a funerary motet – but he makes a convincing case that it is. Solely on the evidence of how the music sounds I can understand such doubts; any doubter hearing this exuberant performance would have their doubts reinforced! The 1980 performance, which sounds as if it might employ a slightly larger choir, is very good but this new one trumps it, not least because it sounds so uninhibited. BWV 229 is another success. I love the impression of intimacy and gentle supplication that comes from the delivery of the repeated opening word ‘Komm’. Indeed, throughout this motet – and elsewhere – the care that the singers take over the words is most impressive – and exactly what we’ve come to expect from Gardiner and his choir. The fugal passage towards the end of the first stanza is really successful on account of the lightness of the singing while Bach’s wonderfully inventive, extended treatment of the line ‘du bist der rechte Weg, der Wahrheit und das Leben’ is marvellously enunciated and balanced. This wonderful performance once again supersedes the 1980 version. In BWV 226 the lightness and precision of the opening give great pleasure while later on the fugue at ‘Der aber die Herzen forschet’ has impressive strength and clarity. The most substantial of the motets, BWV 227, can seem fragmented since it consists of eleven short sections, alternating verses of a German hymn – of no literary merit - and words from St Paul’s Epistle to the Romans. However, this performance certainly doesn’t fall into the fragmentation trap. There’s some vivid and imaginative singing and the entire piece is put over with great conviction. The light choral tone at the start of BWV 228 suits admirably the comforting nature of the text though later on, at ‘Ich stärke dich’ there’s an appropriately strong projection of words and music. The singing in this piece is alert and spirited; Gardiner ensures that the dance-like element is present. When the sopranos sing the chorale, ‘Herr, mein Hirt, Brunn aller Freuden’ as a cantus firmus around which the other voices weave fugal counterpoint, the delivery is magical. The reading of BWV 225 is noticeably tauter than the 1980 version – 16:37 against 19:24. In passing, though the New York performance in the Cantata Pilgrimage series comes in at just 12:59 that’s because there Gardiner only includes one verse of Johann Gramann’s hymn in the central section instead of two. In this new performance when in the first section the singers in Choir II sing the word ‘Singet’ they do so with a real “ping”. In this section there’s an excellent lift to the rhythms and the whole effect is light and joyful. I can’t resist quoting one comment by Gardiner in the notes. Referring to the instrumental nature of the writing in this work he says “By the final section, ‘Lobet den Herrn in seinen Taten’, it feels as though Bach has dragooned all the Old Testament temple instruments into the service of praising the Lord, like some latter-day big band leader.” As so often in his notes for the Cantata Pilgrimage CDs, Gardiner lights up his writing on the music with a memorable turn of phrase which, in its enthusiasm, mirrors the way in which he directs the music itself. I can’t readily recall hearing the first section of BWV 225 sound so dancing and athletic – it’s even sprightlier than the performance in the Cantata Pilgrimage. The 1980 performance, at a steadier tempo, is most definitely shaded here. The slower, fugal central section is beautifully and very thoughtfully unfolded and then the final section is swift and exuberant. Finally, as a kind of coda, Gardiner includes Ich lasse dich nicht, du segnest mich denn. There is a debate about whether or not this is by Bach and if it is then it’s a much earlier motet than the others. The music is much simpler in design and there’s none of the virtuosity displayed in the other motets. However, it certainly forms a tranquil coda to the programme and the performance is predictably stylish. The production values are up to the label’s established high standards. The recording is very good while the documentation is first rate. As for the performances, they are simply superb. The singing is as excellent as we’ve come to expect from the Monteverdi Choir. Sir John, who says he regards the motets as “peerless”, has known them since his childhood and his affection for the music as well as his fastidious ear for detail is evident throughout these thrilling performances. I know that not everyone likes Gardiner’s way with Bach but unless you’re completely allergic to his approach I urge you to hear these recordings – and even those who think they can’t get on with Gardiner in Bach might be pleasantly surprised by these delightful readings. And if you already have the earlier Gardiner set don’t discard it but make sure you invest in this new one and experience the freshness of his approach to these wonderful pieces thirty years on.